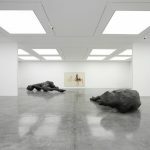 Lisson Gallery present two very interesting and contrasting shows, both dealing with identity and human expression. 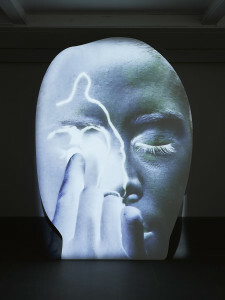 The first show is Tony Oursler’s ‘template/variant/friend/stranger’ which sees the artist using facial recognition technology to comment on the omnipresence of these technologies and the effect they have on modern life. Oursler’s work has always focused on the face and facial expression, projecting it on to inanimate objects bringing them to life. As you enter the gallery you are confronted by five intimidating eight foot structures. Heads murmuring information in a low pitched drone. 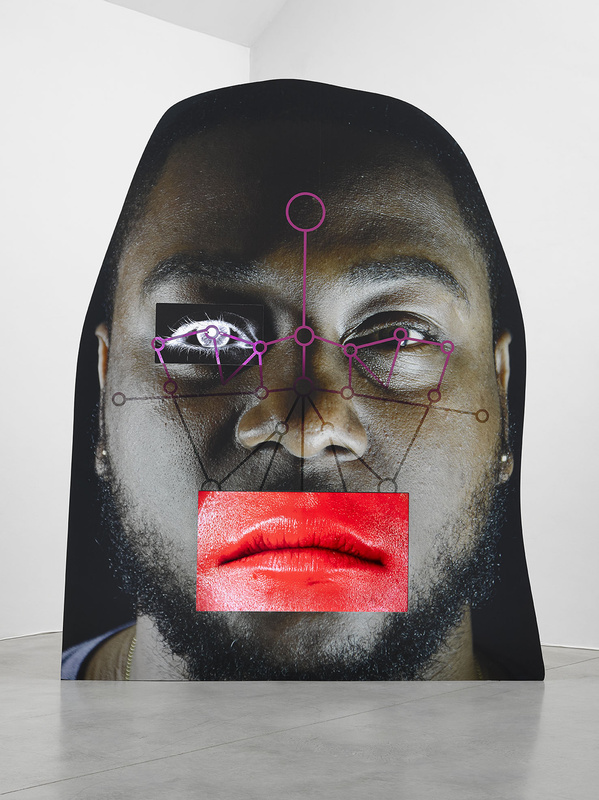 Each face is mapped with the marks associated with facial expression technology that is, ominously, used to recognise individuals in more areas of modern life than is comfortable to think about. The show is a glimpse of an assumed dystopia with an ambiance of Ridley Scottesque science fiction. As you navigate through the soulless metal faces, moaning and flickering, one begins to feel slightly uneasy, almost as if the work is watching or tracking your movements. 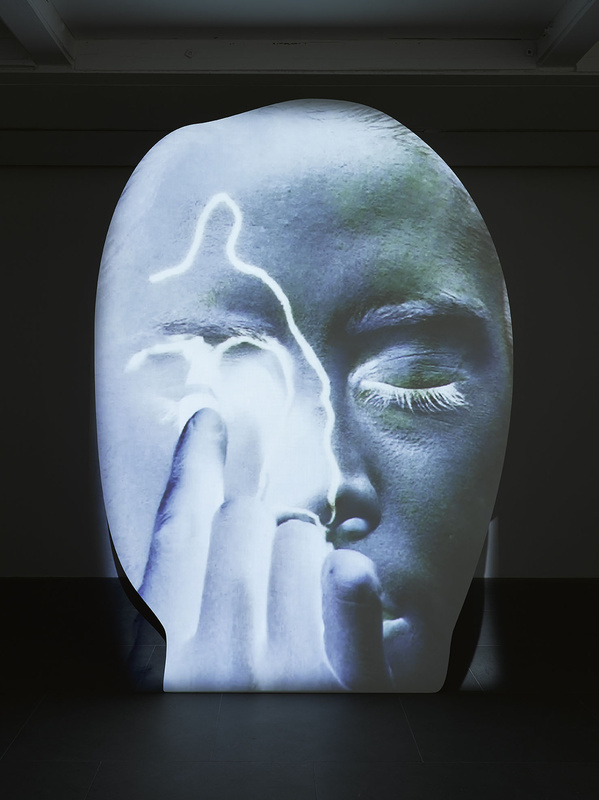 The work is carefully displayed across the different levels of the gallery with a dark video projection, in the basement, of faces morphing and contorting into different shapes, contrasted with bright, colorful drawings of concepts for the large sculptures. 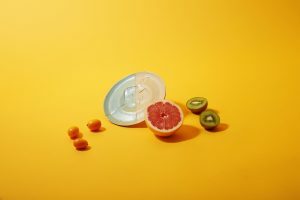 The concepts tackled in the work are, perhaps, in danger of being more complex than the work itself and the accompanying writing gives the idea that the pieces might have functionality beyond just being objects representing an idea. The ideas are bursting with the harsh reality of modern living while the work seems to be an unreal portrayal. It is compelling but comfortable ‘blue chip’ art made by an established veteran and pales, slightly, when compared to the exhibition across the road in Lisson’s second space. Show No.2, ‘Cross Section of a Revolution’, is an intense gaze into politics and religion created by 7 artists using film, photography, painting and sculpture. The work, at points grotesque, represents a discomfort and unsteadiness in humanity. 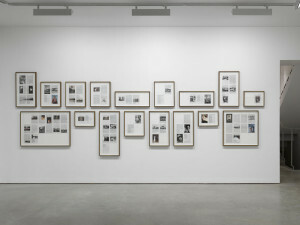 Broomberg & Chanerin’s ‘Divine Violence’ is a scrap book, of sorts, compiled in a copy of the old testament.The pages displayed across four walls contain images that have been chosen from the Archive of Modern Conflict and have been placed carefully in areas of the bible that hold relevance to the pictures. It’s an amalgamation of shocking yet fascinating imagery that was conceived when the artists saw a bible belonging to Bertold Brecht, who had used his in a similar way. A film piece by Allora & Calzadilla documents the destruction of the Glaxo Smith Kline pharmaceutical plant in Puerto Rico. The building is torn apart by a JCB with it’s claw replaced by a church bell. As the plant is destroyed the bell clangs and resonates through the building commenting on the controversial whistle blowing which led to it’s closure. The film builds suspense as the building shakes and the machine groans out of sight. Suspense similar to that induced by monster movies. The fear of not being able to see the destructive force that we know is there. Rashid Rana’s huge digital tapestry shows hundreds of images of animal slaughter arranged to replicate a Persian Rug. 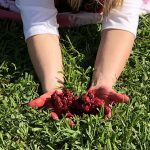 The beautiful and painstaking image is formed out of something which may be considered monstrous and alien to the western world but are normal everyday occurrences in other cultures. A video piece from Wael Shawky shows the artist wandering round a european supermarket intently reciting a verse from the Koran, also behavior which may be misunderstood and perceived as threatening to the uneducated masses. It reflects on the vilification of something that is born out of beauty and love. 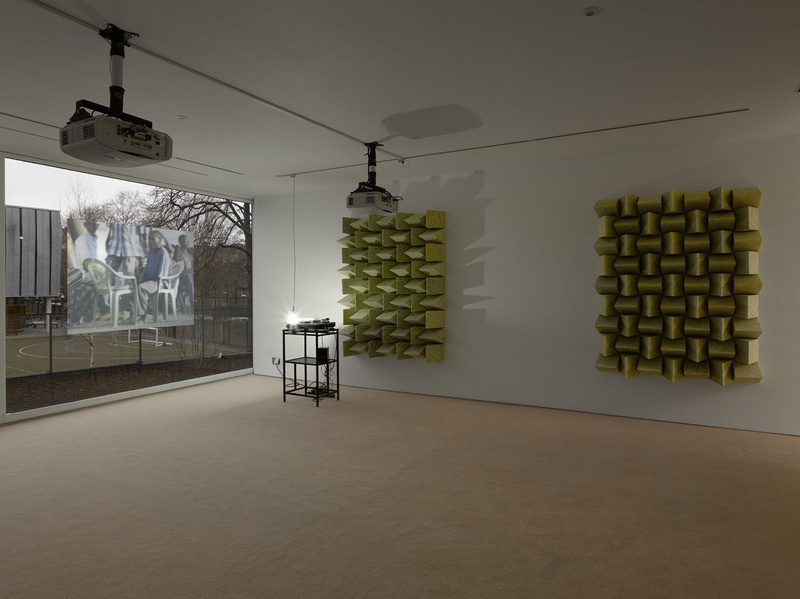 The show’s title piece by Haroon Mirza looks at politics and traditions in a bewildering installation of video and sound, absorbed by foam structures. One of the videos shows two men ritualistically stick fighting to the sound track of drumming while another shows a young man intensely ranting in urdu in some kind of political setting. All this is accompanied by an incessant interfering sound which resonates, unnervingly, from a turntable in the corner. 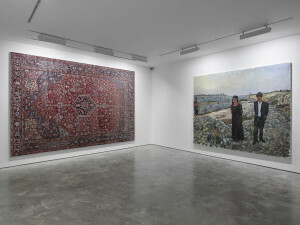 Liu Xiaodong’s, deceptively conventional, oil painting chronicles the plight of Jade miners in Xinjiang and area of China with deep ethnic and social tensions. The artist spent time in this province painting in a studio constructed from canvas documenting the life and work of the miners. ‘Submission (formerly Word of Fire)’ by Santiago Sierra is a photographic print of an installation. 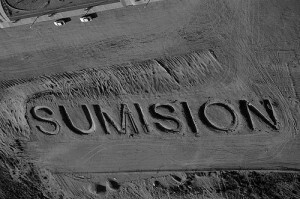 The installation consists of 15 meter high letters spelling out SUMISION. The letters were dug out near to where the U.S. border meets Ciudad Juarez, a sight where the U.S. Government had proposed to build a dividing wall. The lexical trenches had originally been designed to be filled with fuel and set alight to emblazon the word SUMISION but the act was obstructed by local government. Both shows criticise and analyze the world we live in from very different angles but both suggest that there is a lot that needs to be addressed. 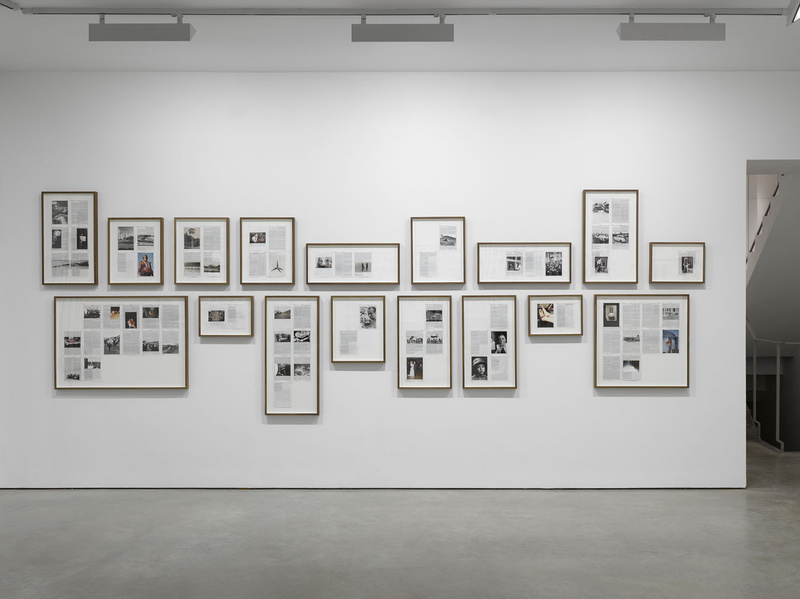 Whether it be the intrusive lack of anonymity presented by modern living or the lack of cultural understanding in modern society both shows contain relevance and interest and are both worth taking time to see. 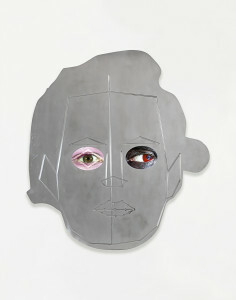 ‘template/variant/friend/stranger’ and’Cross Section of a Revolution’ run until the 7th march. Get all other details HERE. This entry was posted in NEWS and tagged ART, Boomberg & Chanering, contemporary art, Cross Section of a Revolution, Facial Recognition Technology, HAROON MIRZA, Lisson Gallery, Tony Oursler, Wael Shawky. Bookmark the permalink.